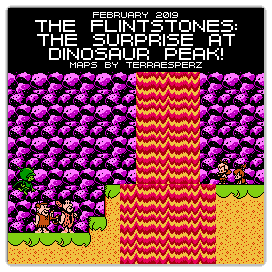 For this month's "Maps Of The Month" featurette, I wish to draw your attention to TerraEsperZ's The Flintstones: The Surprise At Dinosaur Peak! (NES) maps. Maybe the story isn't the greatest, but The Flintstones: The Surprise at Dinosaur Peak! is an above-average licensed platforming game. The graphics are colourful and cartoony, just like one should hope for something based on the Flintstones. You can now switch between Fred and Barney, each with different abilities (unlike the first Flintstones game, The Rescue Of Dino & Hoppy, where you could only play as Fred). And the areas have nice variety, something that regular mapper TerraEsperZ has found joy in mapping for us. And the other thing definitely above average about this game is its price. Probably due to its late release, it was produced in limited numbers, and is now considered one of the rarest NES games ever. If you are a collector, you might expect to pay around or over a thousand dollars for an original cartridge! So to recognize the effort put into mapping this rare game, TerraEsperZ's The Flintstones: The Surprise At Dinosaur Peak! (NES) maps will be known as VGMaps.com's Maps Of The Month for February 2019.